These classes are offers for children ages 3-17 years of age as well as adults. In addition, Soto Academy of Music serves as a comprehensive in-training service for graduates and/or senior music major students from Texas A & M International University, in order to produce quality music education professionals who are dedicated to their music discipline. Soto Academy of Music is under the direction of Gilberto D. Soto, Ph.D., currently Professor of Music Education at Texas A&M International University and National Music Author for Macmillan/McGraw-Hill and Hal-Leonard Music Corporation. In only two years, the academy grew from five to nineteen specialized music instructors, plus four staff assistants. The reason for such grow was the overwhelming increase in the number of students enrolled every semester, from 34 in the 2006 summer session to 298 during the current 2008 fall session. Soto Academy of Music offers a unique commitment of serving the music education needs of the city and surrounding areas. Our mission is to bring about increased awareness of the great music potential and talent that is innate within every child at birth, and to encourage the support and growth of these talents. Our music philosophy, designed for the special needs of a culturally diverse population, is based on music education cognitive, aesthetic, and psychomotor experiences. This innovative music education approach combines mastery of an instrument with effective music pedagogy strategies. Soto Academy of Music believes that through the study of music, we enrich children’s character and ability to learn, and seek to inspire our children’s ability to share their musical and human talents with their families and communities, in order to make them better citizens as a whole. In our music classes students are taught not only to sing and listen to music, but are taught many music skills that are designed to prepare them for a lifetime of informed musical enjoyment. Children begin by experiencing music through listening and singing. Musical elements such as rhythmic and tonal music patterns are identified to develop tonal recognition and rhythmic feel and to prepare for eventual notation reading. Concepts are reinforced through comprehensive music pedagogy and other classroom activities using instruments. As the child progresses he or she becomes more and more prepared for future music study on instruments, in choirs, or simply by enjoying music throughout their lives. This musical experience is indispensable for future music study and personal development! Gilberto D. Soto, Ph.D. is currently Professor of Music Education/Guitar at Texas A&M International University where he teaches early childhood, elementary and secondary bilingual music education courses. He also supervises the guitar and bass studios and directs the “TAMIU Guitar Ensemble”. 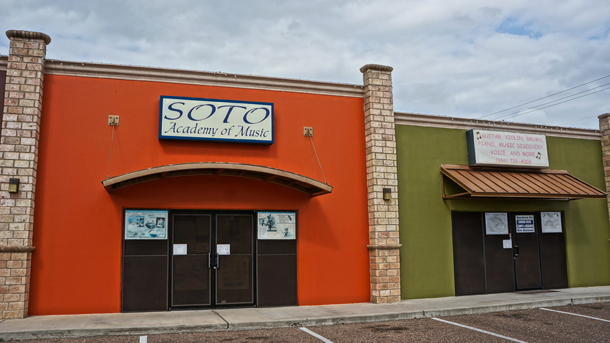 In addition, Dr. Soto is the owner/director of “Soto Academy of Music”, a music studio for children ages 2-18 years old and in which his university students are trained and use as a teaching lab in preparation for their education careers. Dr. Soto is the author of the bilingual books “Fiesta de Canciones” (Primary and Intermediate Levels), co-author of “Multilevel Strategies for English Language Learners”, co-author of the national music series “Spotlight on Music”, co-author of the national reading series “Treasures/Tesoros” and “Wonders/Maravillas”, and song arranger for the National Mathematics Series and the DLM Early Childhood Express, all published by McGraw-Hill Education. Dr. Soto is also the author of “Music of our World: Mexico”, published by Hal Leonard Music Corporation, and has written several articles to “Music Express”, reviewed elementary music education textbooks, and received many awards for his contributions to bilingual music education, especially in under priviledge school communities as well as many awards as a higher educator instructor and guitar performer. He holds a BA degree in Education from Universidad Autonoma del Noreste, a BA in Music from Abilene Christian University, plus a M.M. and Ph.D. in Music Education from the University of Southern Mississippi. Dr. Soto travels extensively offering hands on clinics and lectures in bilingual music education, plus flamenco and classical guitar concerts throughout the United States, Central and South America, plus recently in Spain and at the Middle East. The following are some examples of such contributions:Financial donations to private educational institutions such as Mary Help of Christian, United Day School, Blessed Sacrament School, and Lady of Guadalupe School, among others.Community performances free of charge every semester in order to increase the cultural/fine arts awareness of the city.Community music classes to schools predominantly with low income families (ex. Perez Elementary School).Visitation and performances to elderly homes, Sacred Heart Orphanage, hospitals and community centers. In the past, the Soto Academy of Music has hosted a free after school music community programs in the colonias areas, specifically in Rio Bravo and El Cenizo.